Doctor Watson, returned fresh from Afghanistan with an injured arm and shattered nerves from illness, moves to London on a pension. He is most introduced to Sherlock Holmes, with whom he rooms for some time. He is skeptical about Holmes' self-professed deductive powers, and so Holmes allows him to tag along on a case that the police cannot solve. Needless to say, Holmes thoroughly impresses Watson with his deductive powers, and promises to keep records of all of Holmes' cases so that his excellent detecting doesn't go unrewarded. 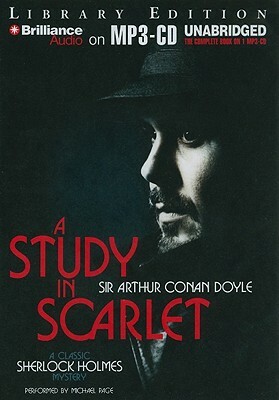 The first part of A Study in Scarlet leads to the arrest of the murderer, and the second part provides the story of the murderer's life and motives, previously unexplained. Part two takes the listener across the ocean to the original settlement of Salt Lake City in Utah, and a story of hardship, love, greed, Mormons, and revenge, and then back to London to sort out the explanations.